Although we applied for unemployment in November, there was a one week delay, and then the first check was mailed to Florida, so we haven’t actually been able to collect a paycheck yet. Lee is collecting $176 a week (taxes were taken out) and my check is $180 a week, and that money will show up in our December statement. We also spent quite a bit on the dog this month which was totally unexpected. The combination of lack of income and extra expenses has us dipping into our savings to cover our costs. I don’t mind dipping into savings when it is just a matter of timing between jobs, but since we still haven’t nailed down a gate guard job (getting closer), it is making me pretty uncomfortable. Having a free place to stay really helps, and I just keep telling myself that that is what we have savings for. And just to show you how quickly things can change as I was typing this (not kidding) I got a call for a gate. We need to be down there tonight so I will stop writing this and start packing! OK, we arrived and I am thrilled that money will start flowing in the right direction again. So back to November. We spent $4,630 with no money coming in this month, but in all fairness $1,135 was related to getting the dog, and the bulk of that was one time expenditures. If you take the dog related costs out, we spent a more reasonable $3495. For more details by category please see below. Campground Fees– Even though we weren’t working we did have a place to stay for free for the entire month, which is what made not working in November even possible. This is the first time in our four years of being full time we have had the opportunity to stay for free with friends for an extended period of time, and we are super grateful for it. I will say we do know lots of people who stay for extended periods with family or friends so this is not that unusual in the RVing world. Just wanted to be transparent about it. Groceries – We went over by $340 in this category which was due to a Costco run and staying with friends. We always eat group meals, which end up costing a little more, but we ate very well in November! We also have tons of food in the RV and I am planning on working our way through that while we gate guard. Never know how close we will end up to a Costco so we also stocked up on paper products etc. Dining Out – I am happy to say we were able to offset some of the grocery bills by not eating out much and we saved $110 in these categories. Everyone knew we were on a budget because we weren’t working and so we ate in almost the entire time. Our friends are awesome that way. Entertainment – We went over in this category but that was mainly due to purchasing books. San Antonio has several Half Price Book stores, which we love, and we stocked up on books in preparation for gate guarding. Truck Fuel – This was another area we did really well in, only spending $130. We carpooled on several occasions and kept most of our trips local. Cigarettes – This is our quarterly cigarette purchase. We buy tobacco and tubes in bulk and roll our own. Even though we take a hit in that particular month it always averages out over the year. Shipping/Postage – Most of this $34 overage was shipping a present to my oldest daughter. I had some things in the RV I had been holding onto, and when we did a purge decided they were too nice to simply donate, so I sent them to her. Pets – OK, let me break this down. The dog himself was $750 from a breeder. He was actually a bargain because the female puppies were $1200. That being said if you are wondering why I just didn’t adopt a pound puppy, I refer you to my previous post on adopting Jack. Trust me, spending that much money was not my first choice. The remaining $384 was a crate, puppy bed, a trip to the vet for $95, a trip to the groomer for $35, dog food, and a ridiculous amount of dog toys and treats. The last purchases were totally discretionary, but have you seen him?. He’s a cutie patooty. Gifts – I went over in this category for two reasons. One I purchased a gift for the people we have been staying with. They wouldn’t let me contribute towards the utilities, so I got sneaky and bought them a gift instead! The second purchase was calendars. A couple of friends of mine have created their own calendars the last couple of years using pictures from their travels, and I took advantage of a Cyber Monday Sale at Vista Print and bought some for my friends and family. I am still $200 under budget annually in this category though, because I have done a much better job of watching my spending this year. Home Repair – A positive and a negative of staying in a place for awhile and not working is Lee can work on the RV. Good news, RV stuff gets fixed, bad news, it always costs money. 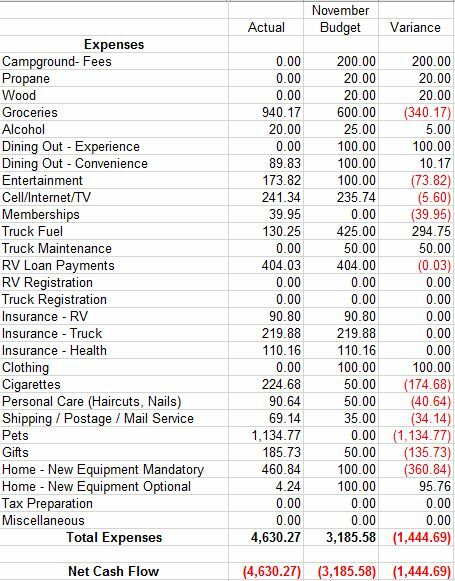 Considering the HUGE lists of things he got done (and I promise those posts are coming up soon), $265 over budget is really not that bad. This month definitely brought it down to the wire and like I started with, I am thrilled we are back to work. Hopefully we will be able to squeeze by and not have to take anything out of savings, but then we need to hunker down and definitely put some money back. I am less worried because we have already locked in our summer job, and if necessary can extend our gate guarding a little bit into April although neither one of us wants to do that. This entry was posted in Lakeside and tagged Full-Time RVer Budget. Bookmark the permalink.